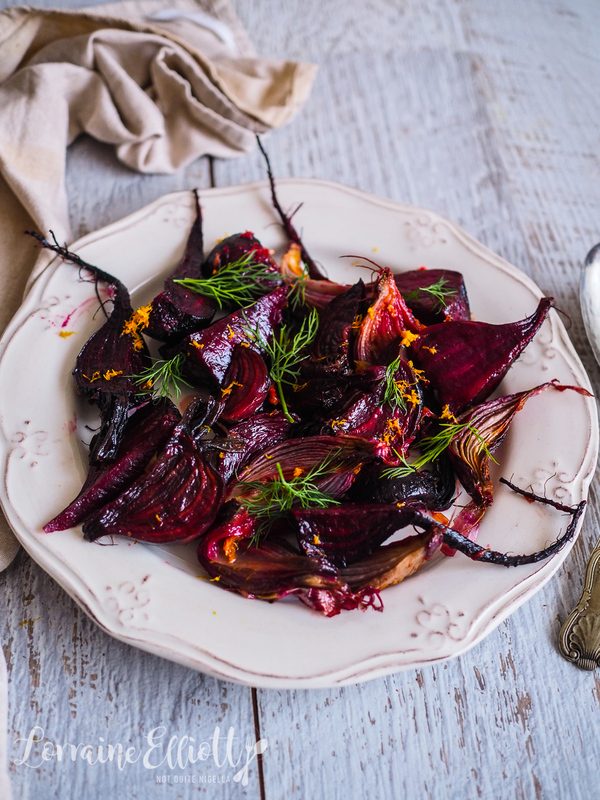 Super Simple Slow Roasted Beetroot & Orange Salad! 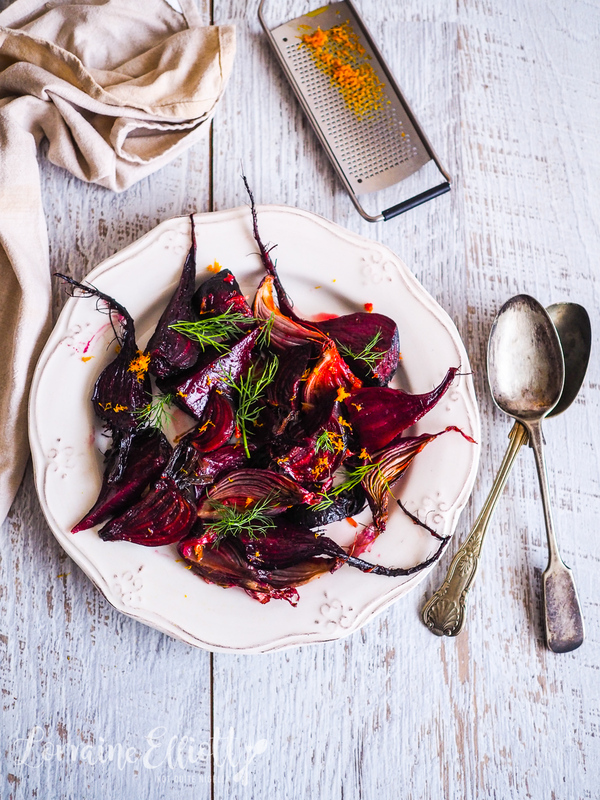 This deceptively simple roasted beetroot salad tastes much more fancy than it is. 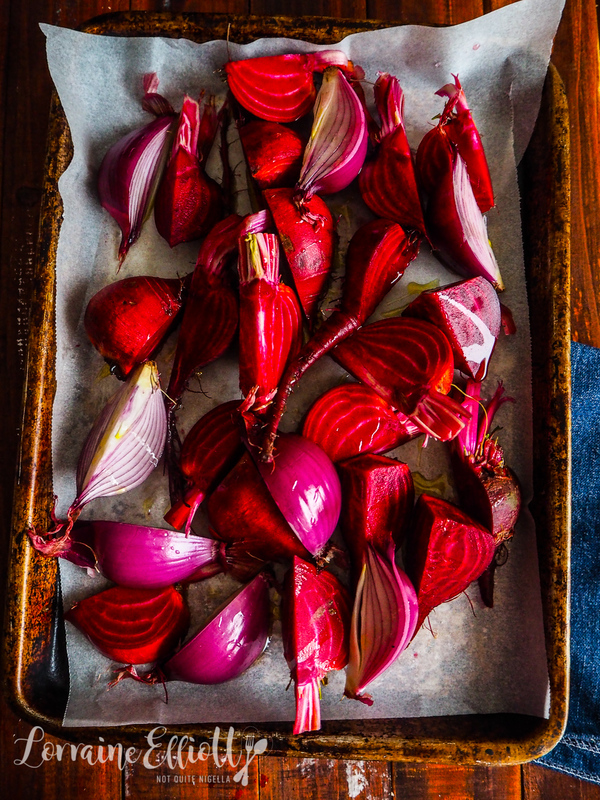 Beetroots are quartered and then slow roasted along with red onions to bring out their natural sweetness. They're then dressed in a simple orange dressing with dill! 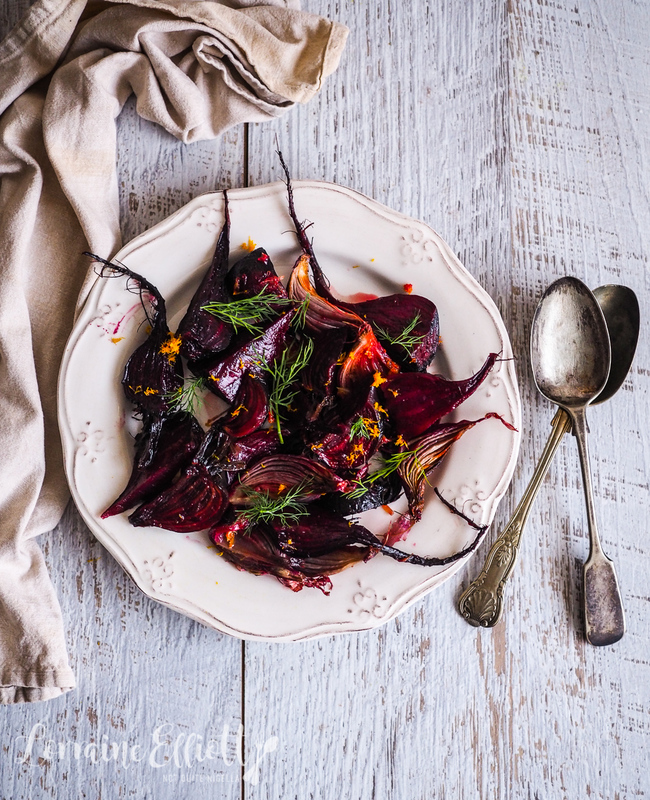 Ever wondered what to make with a whole bunch of beetroot? This dish brings out the fantastic flavour of beetroot and enhances it. And if there's a choice, try to get the whole beetroot, stems, leaves and all as not only can the bulbous root be eaten but so can the rest. Dear Reader, I've been having a few health issues recently and have been really rundown and low in iron. When I go for my weekly market shop, I usually go in by myself while Mr NQN waits in the car as there isn't any parking. On this day I wandered around like I was in a fugue. Luckily he found a park and he came in to help me as I was not doing so well. I looked up at him in a daze and said, "I've only bought tomatoes..." and he had to complete the task. I wondered if I should get some iron supplements - we both believe that a lot of food can heal but I was so far gone that I thought I needed actual medicine but Mr NQN suggested that I eat some beetroot which is high in iron along with some rump steak. And within an hour of eating this salad and steak I felt entirely different, as if I were super charged again! Iron from beetroot is best absorbed when it is combined with citrus so this recipe has an orange dressing. 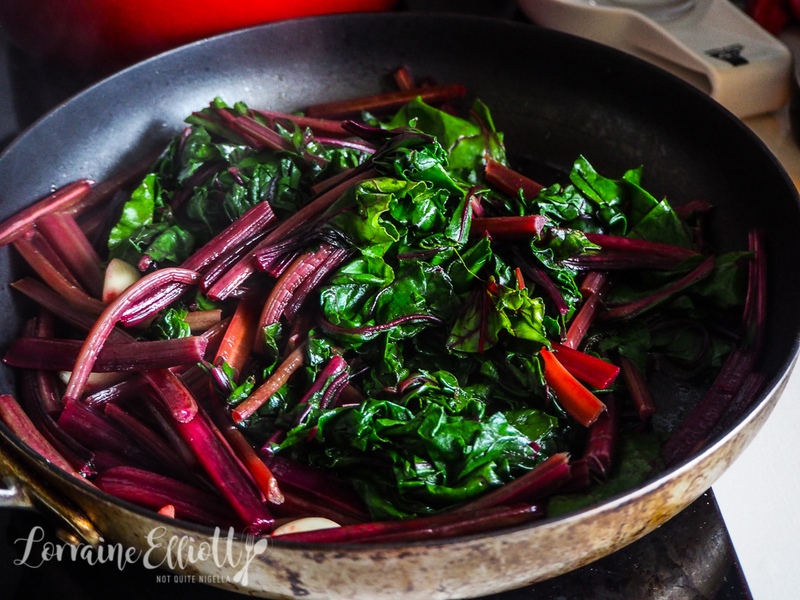 I was in a very overwhelmed state as I was preparing this (times like this I wish I had a chef) and the beetroot leaves were enormous and there were just so many stalks coated in dirt but I didn't want to throw them out because they are so delicious and good for you. And then people on Instagram stories started asking if I would share the recipe so I snapped a few pics and decided to because it was so delicious. A few of you ask about how to make sure that beetroot doesn't taste like dirt and that has to do a lot with scrubbing it very well, sometimes even up to three times with a vegetable scrubbing brush. This is accidentally vegan and really sort of an accidental salad that has such medicinal qualities. Off course the stir fried steak helped too but it was such a quick and significant turnaround for me. I was back to my normal energetic self in no time! So tell me Dear Reader, do you use food as medicine? And what do you do if you're feeling lethargic or low in iron? Step 1 - Preheat oven to 140C/280F and line a large baking tray with parchment. Scrub the beetroot very well (up to three times in all the crevices) and cut into quarters or sixths (depending on how big they are). Cut the onions in similar sized pieces. Drizzle with olive oil and roast for 1.5 hours. At this point you can cool it and leave it to serve in a day or two. Step 2 - Cut the orange in half and chop some orange segments and add it to the beetroot. Squeeze the other half of the juice and dress the salad with it. Season with salt and pepper and decorate with a little dill. Note: I wash the leaves and stalks very, very well as dirt can really hide there. I then slice up the stalks and roughly chop the leaves and then stir fry the stalks first with 3-4 garlic cloves and olive oil then adding the leaves once the stalks are cooked. The leaves cook down quite a lot. Dress with olive oil and balsamic glaze. featureLuscious Vanilla Vegan Cake With Mango & Passionfruit (Egg & Dairy Free)! feature Luscious Vanilla Vegan Cake With Mango & Passionfruit (Egg & Dairy Free)!